Happy belated Canada Day, everyone. I had a lovely long weekend full of swimming pools, ice cream, mojitos and, of course, reading. I found myself a perfect summer read in S.J. Watson’s delicious debut, Before I Go to Sleep. Christine wakes up every morning in a strange bed with a strange man. Every day, that man, her husband Ben it turns out, explains she had an accident two decades earlier that destroyed her ability to retain memories. Not knowing anything about herself for certain—whether she has borne children, if she was happily married—Christine starts a journal to try to piece together her identity. As her entries grow, she begins to formulate the truth, and has to decide if she can trust the man upon whom she is so dependent. A high-concept thriller, Before I Go to Sleep is everything I want in a summer read: well written, page-turning, suspenseful and intelligent. Think Memento meets Eternal Sunshine of the Spotless Mind. And speaking of movies, Ridley Scott has already acquired the film rights. Now I need some summer reads from you—what are you taking to the beach these days? I am blessed to belong to not one but two fabulous book clubs. They couldn’t be more different—one is comprised of very bookish industry folk, and the other of old friends whose conversations often devolve to topics I can’t repeat here (actually, that is starting to happen in the bookish club too as we get to know each other better!) But they are both absolutely wonderful, and those meetings are the highlights of my month. So, I resolve to start doing regular book club recaps here, starting this month. The Vicious Circle is meeting at my place in a couple of weeks to talk about Jamie Zeppa’s wonderful Every Time We Say Goodbye. I really adored it, and I’m anxious to see what my vicious cohorts have to say. Next month, This Ain’t Your Mother’s Book Club also meets at my place, and we’re going to talk Alice Munro in honour of her 80th birthday on July 10th. I agonized over which collection to assign, and in the end I went with The Love of a Good Woman because it’s the home of my favourite Munro story, “My Mother’s Dream.” This collection has some of the best ambivalent mother stories, which are nice and controversial for a book club of mums! For recaps of previous meetings, Kerry’s Vicious Circle summaries are always fantastic. You can read the most recent one here. Alice recaps the TAYMBC meetings over at her fabulous kid/YA column Shelf Candy. Check out her latest post here. Two months since I’ve blogged! Where to start? I have excuses for being absent so long. I started a new position in November, and I’m working in eBooks now. The timing couldn’t have been better. It’s all very busy and exciting and challenging, and that’s good. Very good. But, for the first time in a long time I’m coming home at the end of the day and I’m pretty spent. I’ve been trying to use every spare moment to spend quality time with the kids, and I don’t have much left after that. I’ve managed to read a little, but nothing like I was reading this time last year. The best thing I’ve read so far this year is Jennifer Egan’s A Visit From the Goon Squad. It was on many best of 2010 lists, and for good reason. It’s smart and alive, and a breath of fresh air. Egan is a fantastic storyteller (even the narrative written in PowerPoint works!). Highly recommend. I’m also really happy with this year’s New Face of Fiction titles. I’ve finished all three now, and they are terrific. My favourite is Jamie Zeppa’s Everytime We Say Goodbye. It actually made me cry (in a good way) and a book hasn’t moved me so much in a very long time. It’s on sale on March 8. You’re in for a treat! What books are rocking your worlds these days? 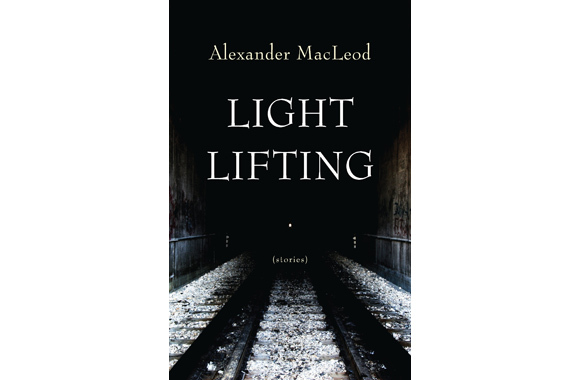 Alexander MacLeod’s Light Lifting is the most exciting thing I’ve read this year, and I want to give a copy to everyone I know. He’s been compared to Alice Munro, and I agree completely (those who know me know this is the highest praise I can give). His stories are electric, visceral, wise, and so awesomely physical. My body was buzzing while I read. He’s that good. Set in Russia’s Far East, a suspected poacher’s remains are found near his destroyed cabin. His body, and his belongings have been brutally destroyed. An investigation by Yuri Trush, the lead tracker and conservationist with Siberia’s Inspection Tiger, reveals that it was not a random attack: the tiger was methodical and seemingly vengeful. With fascinating insight into Russia’s social history, as well as the magnificent, endangered Siberian Tiger, this is an engrossing, informative story of man and nature, and our struggle to coexist. Set in Rome, this debut novel centres around a struggling international English-language newspaper. With each chapter telling the story of a different character—reporters, foreign correspondents, editors, executives—the book reads like a collection of short stories. The narratives interspersed with short chapters on the paper’s 50-year history, the novel also explores recent challenges to the newspaper business: technology, loss of advertising, competition for readers’ attention. Perfectly structured, with compelling, memorable characters, The Imperfectionists is intelligent, ironic and perceptive. Susan Casey investigates the increasingly brutal and baffling “rogue waves,” giants that come out of nowhere and sink ships and pummel oil rigs. She speaks to mariners, climatologists and insurers to try to understand what is causing these waves, and how they impact our planet. Along with the experts, she also speaks to the people who perhaps understand these waves the most: big wave surfers like Laird Hamilton who thrive on the white-knuckle rides these monsters deliver. This is a fascinating book from an environmental standpoint, but I enjoyed the perspectives of the surfers even more (and this is a big part of the book). What motivates them to take such risks? How does it feel to ride a 100 foot wave? How do you get back on the board after you nearly losing your life? The Wave provides answers to these questions, and reading the book is as exhilarating as it is enlightening. Dog is a book lover. He decides to open a bookstore, but no one comes. Someone comes by for tea and leaves in a huff when he tells them he doesn’t sell tea. Someone comes in for directions, but doesn’t want to buy a book. Without any customers, Dog is bored—until he remembers he can read his books and be transported to far off places. And when a real customer finally comes, he gets to do his favourite thing—share the books he loves. This is a charming story (for book lovers of all ages) and Jane adores it. *Are your loved ones reading eBooks? These are all available in eBook format, and you can gift those too! Saturday night my family had the pleasure of hosting my good friend and fellow blogger Karen Green along with her darling family for a Bobby Flay Throwdown! 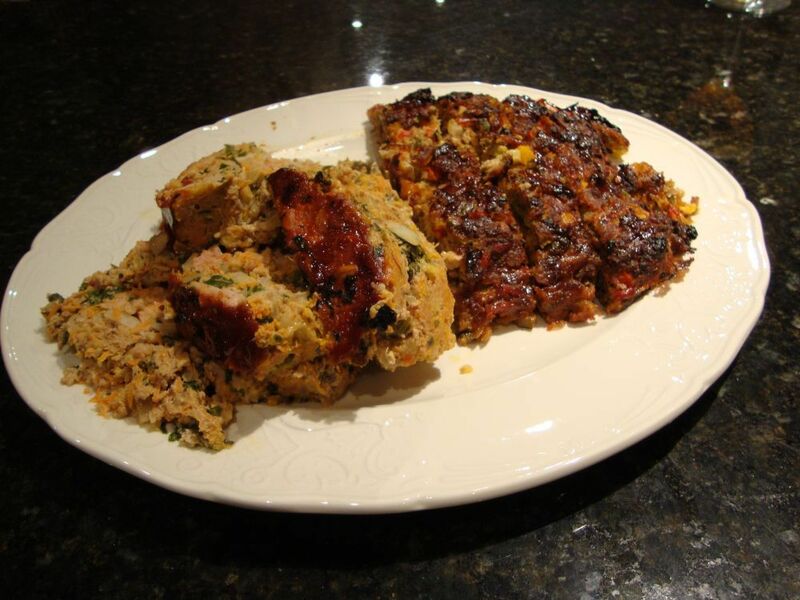 Karen decided to cook up her famous meatloaf while I prepared Flay’s version of the recipe. 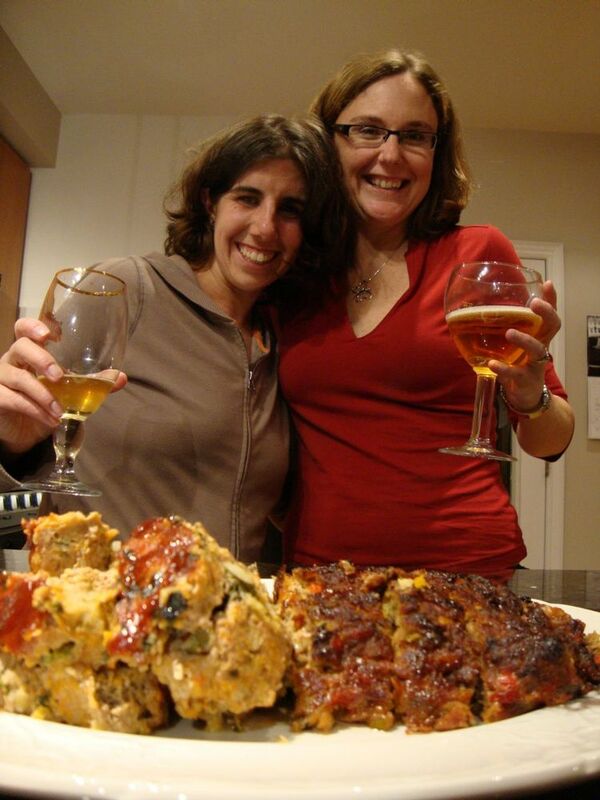 We let the kids run wild while we drank beer, I mean toiled in the kitchen. Both dishes came out of the oven looking beautiful (note the nice crusty topping on each) and we were both proud of our efforts. But, according to the Throwdown rules, we had to turn the judging over to our families. The girls mostly ate fries and salad, but Karen won their vote. Owen took the Throwdown concept a little too literally. 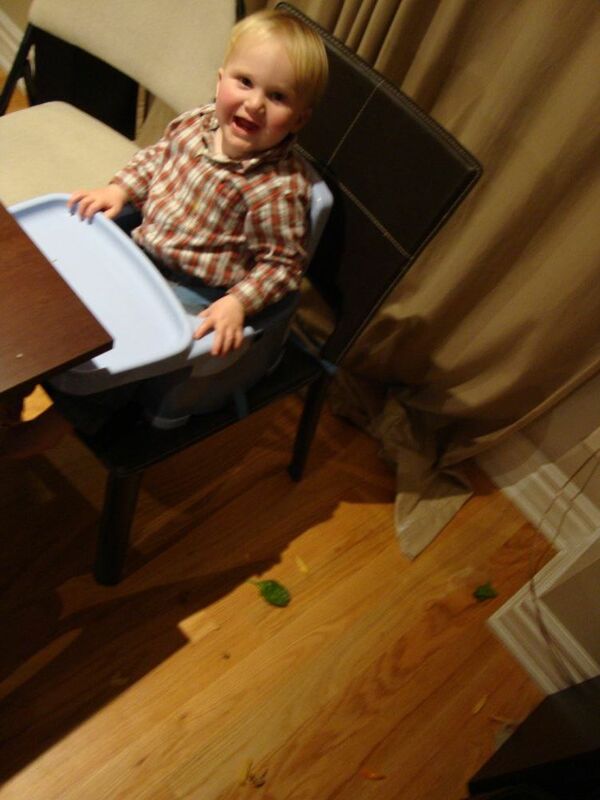 All of his meatloaf went on the floor. 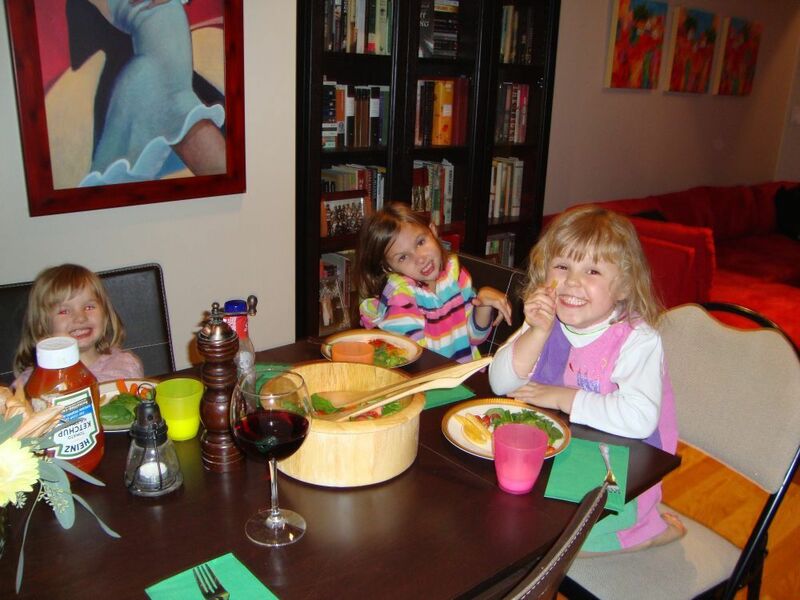 But in the end, the adults unanimously choose Flay’s recipe as the favourite. Having three different kinds of meat definitely helped. And we all loved the balsamic glaze. I’ve read two books recently that really shook the mother part of me. This Ain’t Your Mother’s Book Club’s doing Lionel Shriver’s We Need to Talk About Kevin this month. What a great choice for a club entirely comprised of parents. This is a book that keeps you awake at night, and raises all sorts of interesting questions about reliable narrators, nature versus nurture, forgiveness, responsibility. I think we’ll be talking for hours about this one, and I am going to bring two bottles of wine this month. Highly recommend this book. Now it’s time for something a little lighter. A couple of my friends are asking on Twitter for something “happy” to read. Can anyone suggest something? I had just intended to dip in to Susan Casey’s The Wave, but I was soon swept up, and I rode it out to the end. Susan Casey (author of The Devil’s Teeth) investigates the increasingly brutal and baffling “rogue waves,” giants that come out of nowhere and sink ships and pummel oil rigs. She speaks to mariners, climatologists and insurers to try to understand what is causing these waves, and how they impact our planet. Along with the experts, she also speaks to the people who perhaps understand these waves the most: big wave surfers like Laird Hamilton who thrive on the white-knuckle rides these monsters deliver.